Kent County Council is reminding drivers about their responsibilities to stop for school crossing patrols. The authority is bringing in a new incident reporting process so that it now gathers information about all incidents of ‘failed to stop’ and refers them to the police to take action. School crossing patrols have a legal right to stop traffic for anyone who needs help crossing the road. Chris Knight, 46, has been a school crossing patroller for the past three years and had first-hand experience of an impatient driver. He said: “I was doing a patrol on a wet and miserable day and I walked out into the road to allow children to cross and out of the corner of my eye I saw someone approaching so stayed there to allow him to cross as well. “A car then came towards me and I had to jump out of the way. I asked him what he thought he was doing and the driver made a gesture suggesting he didn’t understand me and he drove off. “I’m glad that the driver has not got away with this and was made to go on a driver improvement course and hopefully they won’t do it again. If people think they can get away with it once, they’ll do it again. 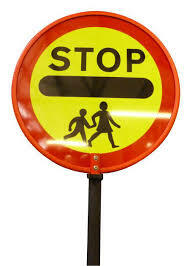 It is an offence to fail to stop when a school crossing patrol displays the stop sign. KCC cabinet member for transport Mike Whiting said: “Our school crossing patrol officers have the same authority as a police officer to stop traffic, as set out clearly in the Highway Code. “Failing to stop puts vulnerable road users at risk and the patrol staff are instructed to report any driver who fails to stop to the police and this could result in prosecution.